Climbing Mount Kilimanjaro: This Free Guide Gets You To The Summit! This Guide Will Get You To The Summit! Super fit athletes in their 20s or 30s regularly fail to climb Kilimanjaro. Elderly folks in their 70s and even 80s regularly make it to the summit. There is a reason for that. The overall success rate on what is supposed to be the easiest route is said to be 42%. Some trekking operators have client success rates between 80% and 90%. There are good reasons for that, too. I will show you how you can approach your Kilimanjaro climb with a summit success chance of 90% and more. I'm not kidding and I'm not promising too much, either. So how difficult is it really to climb Mount Kilimanjaro? On the summit of Mount Kilimanjaro, Uhuru Peak. See the lady on the right? She is 64 years old in that photo. She is by no means fit, not at all. She would not disagree if I called her a couch potato. And she smokes! As you see, she made it to the summit. The woman is my mother. (That's me on the left). And the reason that her Kili climb was such a huge success was NOT her fitness level. It was the planning and preparation. Skip the story and start learning about the planning and preparation. 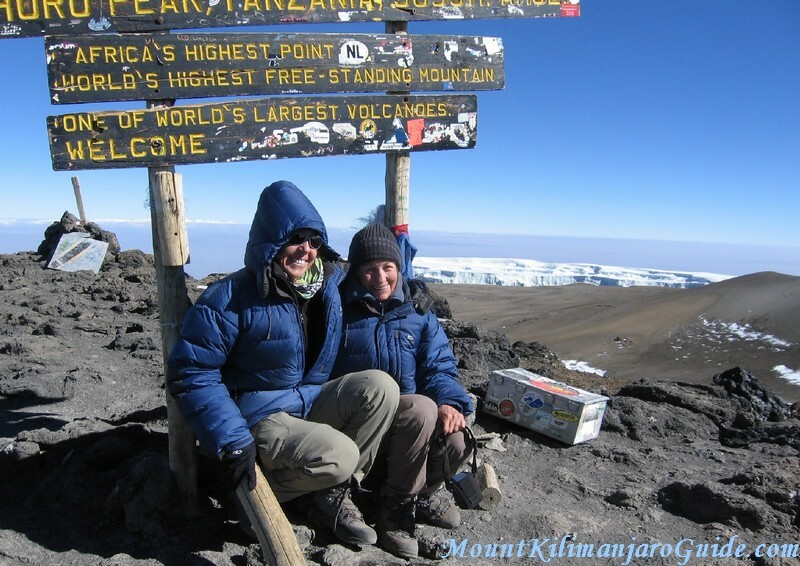 Climbing Kilimanjaro had been her dream since she was about 24 years old. We, her children, only learned about it on her 48th birthday when her partner gave her a book about it. The book was written by a guy who climbed Kilimanjaro for his 50st birthday. The present was meant to encourage my mother, to show her that she could still do it. It didn't quite work out, because two years later my mother felt that now it definitely was too late. All up it took me 15 years to talk the woman into going after her dream! When she said yes, I freaked! I freaked because people die on Kilimanjaro every year. Oh my god, what if I became responsible for killing my mother?! That was a bit paranoid, of course, but nevertheless, I couldn't get it off my mind. The other fear was not paranoid at all. What if she didn't make it?! This dream was 40 years in the making. If it didn't work out, that would crush her, right? My mother was actually totally chilled about it. For her it was all about the experience. Being in Africa, seeing the mountain, trekking through the different climate zones, returning from the harsh, lifeless upper slopes to the teeming jungles below... That kind of thing. But I wasn't chilled! The pressure was huge. This HAD to work out, it just had to. It had to be perfect. So I researched. And researched. And then I researched some more. When we left for Tanzania I knew that we had done absolutely everything we could to maximise our chances of success. We pretty much could not fail. And we didn't. The trip was all around awesome, one of the best things I have done in my life, and I am pretty proud of making it happen. Skip down to learn how to make it happen for yourself. Or your mother. Or whoever. On the crater rim of Mount Kilimanjaro. Here are a few more interesting facts, albeit not necessarily statistically relevant. All in our group made it to the crater rim. One woman did not continue because she had never planned to do so. She did not show any signs of being affected by the altitude, and I am sure if she had wanted to, she could have made it to the summit. One younger guy had to turn around because he was getting way too cold and weak. He had been struggling with the altitude for the last couple of days already. There were nine people in our group, the other seven made it to the summit. The operator had a second group on the same route at the same time. They all made it to the summit. That is 13 people out of 15, or 86.7%. An 86.7% success rate and none of the other climbers were particularly well prepared at all. Route selection, climb duration, time of the year and last but not least the climb operator are all huge factors by themselves. Add good preparation, and over 90% is not a stretch at all. It's a done deal. Oh, and one more thing. When our group met for the very first time, for our briefing and to meet our guides, and after we had all introduced ourselves and told a bit about how we had prepared, there were two people in our group who the head guide said he can pretty much guarantee will summit. My mother an I. Choose well, prepare yourself well, summit well. so can you, and I will show you how. I hope I have managed to convince you that climbing Kilimanjaro is well within your capabilities and inspired you to read on. I will now take you step by step through everything you need to know and do to make it happen. That includes things that absolutely NEED doing, like organising visas, getting vaccinations, insurance etc., as well as all the things you CAN do to maximise your chances of success and the enjoyment of your trip! You'll probably learn a bunch of interesting stuff along the way, too, so let's get going. 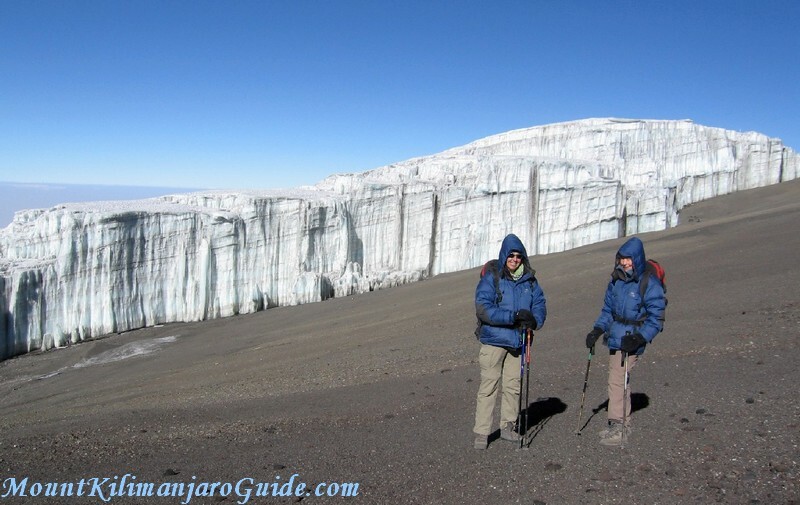 On this page you can get a good overview of what it takes to climb Mount Kilimanjaro. Every issue that I mention here is explained in detail on another page, often several pages, but this is the place to start! The weather on Mt. Kilimanjaro affects your climb and your success chances. Read about what to expect at different times of the year. There are seven routes and they vary in length and difficulty. Read about their advantages and disadvantages. One of the most important decisions you have to make is to pick a tour operator or trekking agency. This page tells you what to look out for. Climbing Kili is expensive. This page tells you where the money goes, and why it's money well spent. What training do you need? And when should that training start? What should you do? And how much of it? It is not the lack of fitness that prevents people from reaching the summit, it's altitude sickness!